LILOG was a project that produced more than could have been expected at the outset. Not only were a large number of scientific papers, implemented systems, diplomas, dissertations and professors produced, but also a large part of a whole generation of scientists working on language understanding was brought together. 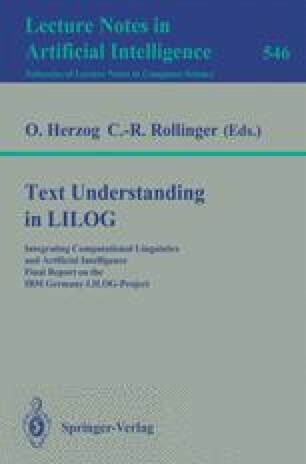 The present book on LILOG makes clear that LILOG represents a great step forward in the development of a theory of text understanding. Futhermore this step forward is not only to be found on paper but also in the fact that a large part of the theoretical results have been integrated into an operational system, LEU/2. Without any doubt there is still a great deal to be done, but LILOG has already shown how worthwhile it is to go on in this direction. Special thanks go to Prof. Dr. Dr. h. K.Ganzhorn, the initiator of LILOG, to the Senior Executives G. H. Müller and A. E. Esslinger of IBM Germany reponsible for LILOG and to the Director of Science and IBM Fellow Prof. Dr. Folberth and his successor Dr. W. Glatthaar. They all supported LILOG to a very high degree and saw the value of basic research for spin pffs and future products in this special area. We hope that LILOG may fulfill the expectations that were put on it.